TRICKS by which the movie director fakes many of his effects are interestingly explained in this article, written by a man who has been a cameraman and who is well versed in the tricks of the trade. SEEING is believing—unless you happen to see it in the movies! The next time you step into your favorite movie theater to see some million dollar production, don’t stop to marvel at the luxurious palaces and castles which you see on the silver screen, because the chances are a hundred to one that they didn’t exist at all— except as a thin film of paint which fooled the gullible camera lens so completely that the innocent thing didn’t even suspect it was being made fun of! 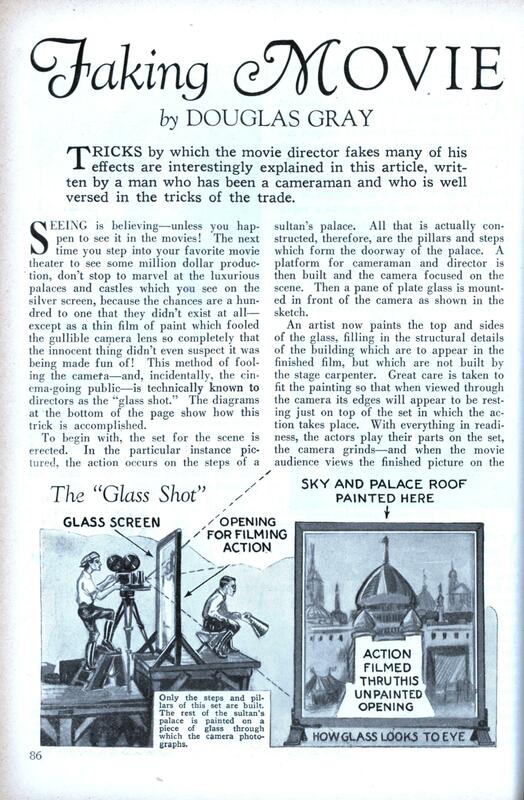 This method of fooling the camera—and, incidentally, the cinema-going public—is technically known to directors as the “glass shot.” The diagrams at the bottom of the page show how this trick is accomplished. To begin with, the set for the scene is erected. In the particular instance pictured, the action occurs on the steps of a sultan’s palace. All that is actually constructed, therefore, are the pillars and steps which form the doorway of the palace. A platform for cameraman and director is then built and the camera focused on the scene. Then a pane of plate glass is mounted in front of the camera as shown in the sketch. An artist now paints the top and sides of the glass, filling in the structural details of the building which are to appear in the finished film, but which are not built by the stage carpenter. Great care is taken to fit the painting so that when viewed through the camera its edges will appear to be resting just on top of the set in which the action takes place. With everything in readiness, the actors play their parts on the set, the camera grinds—and when the movie audience views the finished picture on the silver screen, it marvels at the expense the big producers go to in constructing elaborate buildings just to shoot a few action scenes. Most of the big productions employ the glass shot to some extent. Among the newer films, “Noah’s Ark” and Douglas Fairbanks’ “The Iron Mask” use this device to gain many of their effects. The “glass shot,” of course, is not the only means of tricking the camera. You have undoubtedly seen movies in which there are train wrecks, auto crashes, ship- wrecks, and all sorts of disasters, and you probably think that actual locomotives and automobiles were used. Sometimes, of course, they are; but very often what you see on the silver screen are merely miniatures built to scale and photographed against moving backgrounds. The camera can’t tell the difference between a life-size sailing ship and a three-foot model, unless the two are side by side for comparison. Taking advantage of this fact, directors prefer to film their sea-scenes in a washtub, where the water is sloshed about by an electric motor which sways the tub, and the storm-tossed ship is a carefully built model about a yard long. Large or small waves can be created at will simply by speeding or slowing the motor. When the picture is thrown on the screen, nobody suspects that the action occurred in a washtub! Fantastic pictures showing magic carpets floating around in the sky are likewise produced through the camera’s inability to distinguish between the life-size and the miniature. 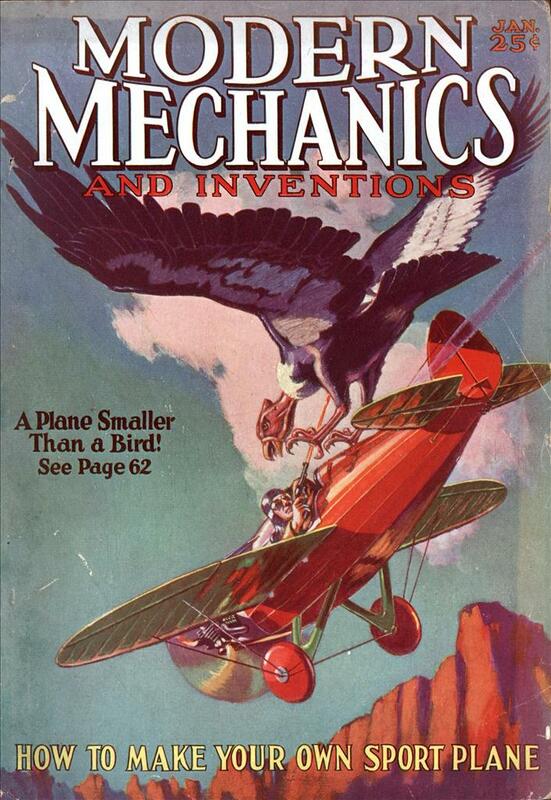 Tiny puppets are fastened to the flying carpet, their actions controlled by invisible wires. The puppet master causes the figures to dance and the camera faithfully records what it sees, which is a life-size carpet floating against a background of cloudy sky! Entire cities are frequently built in miniature so that the camera can shoot a few hundred feet of atmospheric background. The expense in building small sets is very much less than large ones, of course, and movie producers are business men who are not eager to throw money away needlessly. Professional movie cameras have an attachment by which a single turn of the crank exposes but one frame of the film. When the director wishes to show an automobile race, therefore, it is a simple matter to provide miniature automobiles on a miniature track. The crank is turned once, then the cars are moved forward a short distance, and another shot is made—and so on, until the race is run. This type of exposure is the same method followed in making animated cartoons, except that in cartoon each succeeding drawing must be painstakingly done to show a moving leg or arm in a slightly advanced position. In the production of Sir Arthur Conan Doyle’s “The Lost World,” tiny replicas of prehistoric monsters were carefully made and animated by the stop-shot method. Each wink of the dinosaur’s scaly eye, each gaping movement of its slavering jaws, was produced by the method explained above. Naturally the process was extremely tedious. The film required about three years for its production. When the miniature monsters were filmed, they had in many cases to be superimposed over other “shots” showing the human actors in the story registering fear of the beasts. The relative sizes of men and monsters had to be carefully calculated, so that when the finished picture was shown the illusion of actuality was successfully presented. The opening “Persian market” scene from “Casablanca” was shot this way. The main drawback of the glass shot technique is that you can’t change the camera angle. Some years ago I moved a number of the Star Wars models for Lucasfilm. For the “Death Star” they bought a big pile of ordinary plastic battleship model kits and used the parts in creative ways. Close up you could see ordinary WW II gun turrets and even a lifeboat! It was only half a sphere, since only one side was used for the shot. For the close shots of skimming the surface of the Death Star they had large plastic foam sheets carved into geometric shapes and the camera rode on a cable above them, then the film was sped up. For the background shots of the speeders in the forest, a cameraman walked through the woods with a steadicam, and the film was sped up to an apparent 100 mph.